Metalicious is delicious, fashionable jewelry for passionate people. Stephanie believes in creating high quality, wearable styles made from genuine gemstones and sterling silver. Her newest collection is called Modern Rock. It features hand-carved gemstone shapes that are cast into sterling silver, then polished up to look like real diamonds. You get the bling without paying a fortune! Tell me about how you originally got into your craft, Stephanie. 12 years ago I was in a boring job and was desperate for some creative challenges where I could use my hands. I took myself to the local art school but the pottery class I was interested in was closed. Hmm. The only thing left was a metalsmithing class. So I hammered my heart out and have never looked back. I still have what looks like a tin-can I forged from copper sitting on my jewelry bench. It reminds me how close I came to missing out on my true calling as a jeweler. Carve waxes! I have a step-by-step on my blog showing how I do it. Every single time I finish a piece I can't believe that I made it. I'm also a stay-at-home Mom to a 4 year old hilarious little boy. I'm really lucky to be able to spend this time with him, it goes by too quickly! Some days he likes to help me do my jewelry work. That's a tough one, I love all of my pieces as if they were my kids. I think the next two items would be my newest carving and my latest Modern Rock studs. 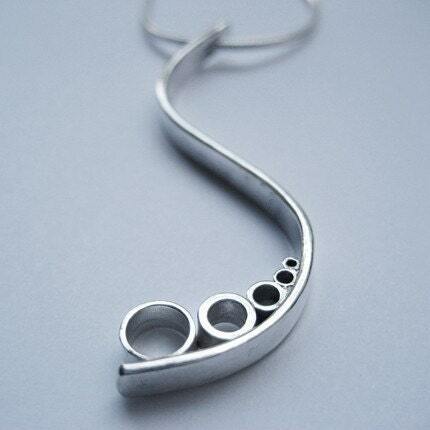 Ooh, and I'd also love one of my Muse necklaces. They are perfect to send secret little messages. I wanted to be a hippopotamus. My mother always told me I could be whatever I wanted to be. And I loved hippos. Gosh, the way I eat now I'm pretty much on my way to becoming one, too! eep. OneGarnetGirl-- I have loved her work since the moment I found her on Etsy. Then I found out what a great person she is, it is even more reason to support her shop. DMDMetal makes some really great Urban Jewels. And to put all your jewelry, how cute are these bowls by EnglerGlass? If I could, I would cover my walls with art from Messicakes. Yep, I like Modern stuff. A lot. hee! Hopefully my kid will grow up to be a decent citizen who treats people and the world with care. I hope that my business continues to grow, and that my Modern Rock collection finally catches on. I always want to make jewelry, my hands itch otherwise and I can't imagine living with itchy hands for the rest of my life. And someday, eventually, I WILL become a hippopotamus. Or else just eat like one. Thank you so much for 'listening'! Visit Metalicious at Etsy or uberjewelry.blogspot.com or stop by the Hoboken Art & Music Festival on May 3rd from noon-6 if you're in the area of Hoboken, NJ! Click here for more upcoming events and keep an eye out for a new collection in work called Wrought based on this ring. The whole collection should be ready by the end of June. I can't wait!